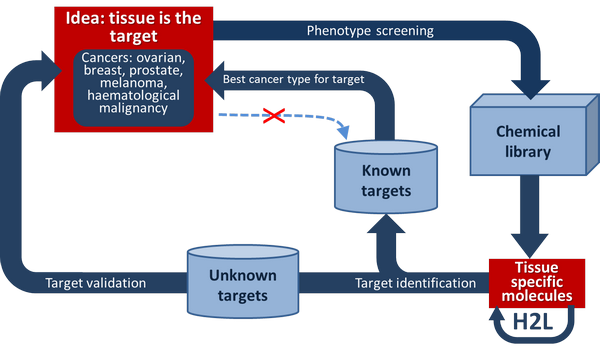 Phenotype-based screening is performed first, without a priori knowledge of molecular target, followed by hit to lead optimization. When target is identified for a discovered lead compound with desired tissue specificity, it could be either previously known or a completely new target. Novel molecular targets are characterized and considered as entry points into additional target-based drug discovery rounds. If the identified target is already known, tissue specificity of the found lead compound points with certainty which cancer type should be pursued for the development. OncoTartis research team has strong experience in both chemical and biological screenings. TARTIS technology has been applied to identification of compounds to treat breast, prostate, ovarian cancers, melanoma and hematological malignancies.